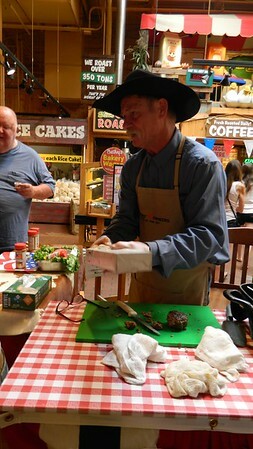 NEWINGTON - Cowboy cook and Food Network guest chef Kent Rollins spent the day at Stew Leonard’s Sunday. 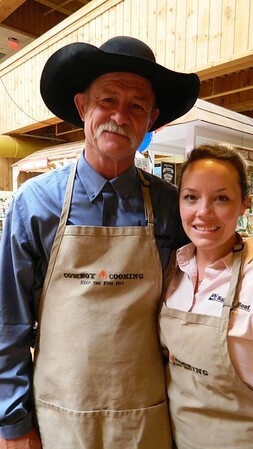 Rollins and his wife, Shannon, who hail from Hollis, Okla., shared their chuck wagon way of cooking with visitors to the store. 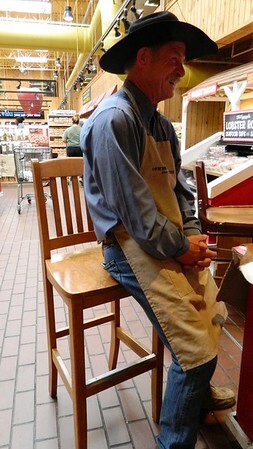 It was the third of six stops on their tour of Stew Leonard’s stores in Connecticut and New York. Rollins has visited the last four years and has built a strong relationship with the Stew Leonard’s family. Newington resident Sarah Viggiano recognized Rollins from his appearances on the Food Network channel. “You were on ‘Chopped,’ right? Can I take a picture with you?” she asked him. “Of course, darlin’,” he said with a smile and a tip of his hat. In addition to “Chopped: Grill Masters,” Rollins has appeared on Food Network’s “Cutthroat Kitchen” and “Throwdown with Bobby Flay,” on which he beat the famous chef. Rollins said his favorite place to cook is outdoors, especially on large ranches out in the country. He and Shannon have taken their business, Red River Ranch Chuck Wagon Catering, on the road. Rollins was discovered by representatives from National Beef, a beef processor headquartered in Missouri. He is now sponsored by the company, along with Certified Angus Beef and Yeti. 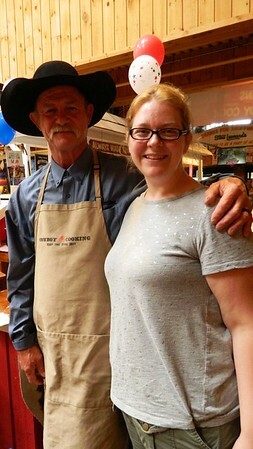 He spent the day Sunday talking to visitors about beef and offering his tips on cooking it. 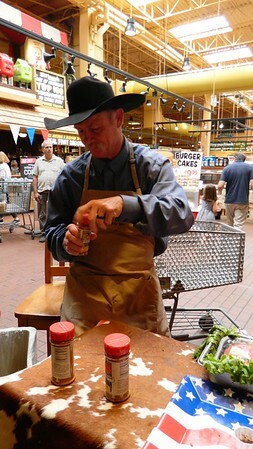 He seasoned the store’s specialty filet mignon burgers with his Red River Ranch brand seasoning and grilled them inside, handing out samples. Resident Bob Conners said he was amazed by the flavor. “You can’t buy any hamburgers with flavor like this,” he said. Rollins’ first cookbook, “A Taste of Cowboy,” received praise from some big names, including Chef Ted Allen. His second cookbook is due out later this year. Today, Kent and Shannon Rollins will be at Stew Leonard’s in Farmingdale, N.Y.
Posted in New Britain Herald, Newington on Sunday, 1 July 2018 21:01. Updated: Sunday, 1 July 2018 21:04.